At a top regional security forum on Saturday, US Defence Secretary Jim Mattis said China’s recent militarisation efforts in the disputed South China Sea were intended to intimidate and coerce regional countries. Mattis told the Shangri-La Dialogue that China’s actions stood in “stark contrast with the openness of [the US] strategy,” and warned of “much larger consequences” if China continued its current approach. 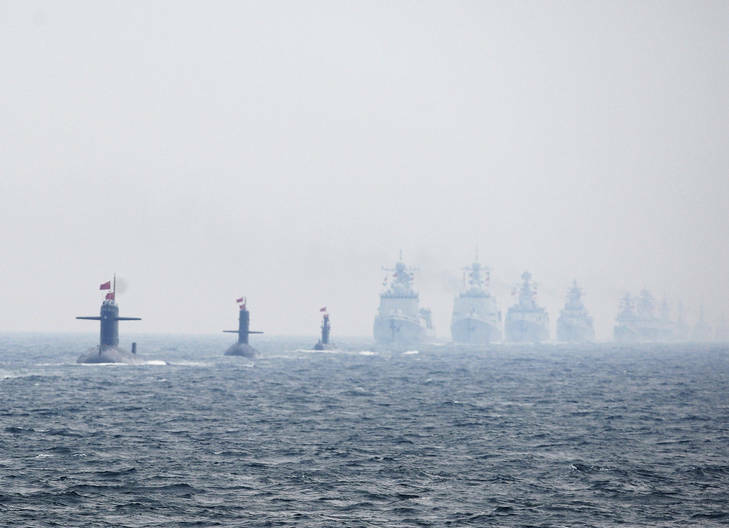 As an “initial response”, China’s navy has been disinvited by the US from the upcoming 2018 Rim of the Pacific Exercise, the world’s largest international naval exercise. It is important to understand the context of the current tensions, and the strategic stakes for both China and the US. Is China playing a long game in the South China Sea? In recent years, China has sought to bolster its control over the South China Sea, where a number of claimants have overlapping territorial claims with China, including Vietnam, the Philippines and Taiwan. China’s efforts have continued unabated, despite rising tensions and international protests. Just recently, China landed a long-range heavy bomber for the first time on an island in the disputed Paracels, and deployed anti-ship and anti-air missile systems to its outposts in the Spratly Islands. China’s air force has also stepped up its drills and patrols in the skies over the South China Sea. While China is not the only claimant militarising the disputed region, no one else comes remotely close to the ambition, scale and speed of China’s efforts. The South China Sea has long been coveted by China (and others) due to its strategic importance for trade and military power, as well as its abundant resources. According to one estimate, US$3.4 trillion in trade passed through the South China Sea in 2016, representing 21% of the global total. China’s goal in the South China Sea can be summarised with one word: control. In order to achieve this, China is undertaking a coordinated, long-term effort to assert its dominance in the region, including the building of artificial islands, civil and military infrastructure, and the deployment of military ships and aircraft to the region. While politicians of other countries such as the US, Philippines and Australia espouse fiery rhetoric to protest China’s actions, Beijing is focusing on actively transforming the physical and power geography of the South China Sea. In fact, according to the new commander of the US Indo-Pacific Command, Admiral Philip Davidson, China’s efforts have been so successful that it “is now capable of controlling the South China Sea in all scenarios short of war with the US”. China’s efforts are hard to counter because it has employed an incremental approach to cementing its control in the South China Sea. None of its actions would individually justify a US military response that could escalate to war. In any case, the human and economic cost of such a conflict would be immense. The inability of the US to respond effectively to China’s moves has eroded its credibility in the region. It has also fed a narrative that the US is not “here to stay” in Asia. If the US is serious about countering China, then Mattis’ rhetoric must be followed by action. First, the US should clearly articulate its red lines to China and others on the kinds of activities that are unacceptable in the South China Sea. Then it must be willing to enforce such red lines, while being mindful of the risks. Second, the US needs to renew its efforts to cooperate with allies in the region to build capacity and demonstrate a coordinated commitment to stand in the face of China’s challenge. Third, the US needs to deploy military capabilities in the Indo-Pacific region, such as advanced missile systems, which would reduce the military advantages gained by China through the militarisation of the South China Sea features. China’s tightening control over the South China Sea is worrying for a number of regional countries. For many, the shipping routes that run through the South China Sea are the bloodlines of their economies. Moreover, the shifting balance of power will enable Beijing to settle its territorial disputes in the region for good. Without a doubt, China is willing to use its new-found power to change the status quo in its favour, even at the expense of its weaker neighbours. Control of the South China Sea also allows Beijing to better project its military power across South-East Asia, the western Pacific and parts of Oceania. This would make it more costly for the US and its allies to take action against China, for example, in scenarios involving Taiwan. On a higher level, China’s assertive approach to the South China Sea demonstrates Beijing’s increasing confidence and its willingness to flaunt international norms that it considers inconvenient or contrary to its interests. There is little doubt China is becoming the new dominant power in Asia. Its rise has benefited millions in the region and should be welcomed. But we should also be wary of Beijing’s approach to territorial disputes and grievances if it employs military and economic intimidation and coercion. If we want to live in a “world where big fish neither eat nor intimidate the small”, then there must be consequences for countries, including China, when they flaunt international norms and seek to settle disagreements with force. It may be too late to turn the tide in the South China Sea and reverse China’s gains. No one would run such a risk. But it is not too late to impose penalties on China for further destabilising the region through its actions in the South China Sea. The challenge is to figure out how to do that, and what we would be willing to risk to achieve it. The secretary of the Defence department, Dennis Richardson, has expressed Australia’s strong concern about China’s recent land reclamation in the South China Sea area. The speed and scale of the reclamation on disputed reefs and other features raised the question of China’s intent and purpose, Richardson said in very pointed comments, noting that if it were for military purposes this would be particularly worrying. Delivering the Blamey Oration, Richardson said that looking out over the next two decades, the relationship between the United States, China, Japan and India would provide the backdrop and centrepoint to much of what unfolded in East Asia and beyond – just as the Cold War had done in the second half of last century. “The US-China relationship sits at the centre. And this invariably opens up the question of just where and how Australia positions itself,” Richardson said. Australia’s relationship with and interests in China were sometimes different from those of the US – as shown by the recent decision to join the Asian Infrastructure Investment Bank. “Obviously, the Australia-China relationship is still developing the appropriate balance of trust and confidence – in many respects a never-ending journey in international and strategic relations,” Richardson said. Australia was concerned about the unprecedented pace and scale of China’s land reclamation activities in the South China Sea over the last couple of years. It was legitimate to express these concerns “because tensions and potential miscalculations are not in anyone’s interest”. Richardson also said regional changes would eventually raise questions about whether Australia’s defence needs can be met with a spending level of 2% of GDP. He foreshadowed that a changing Indonesia would require new thinking by Australia. With few exceptions Australia’s South East Asian neighbourhood would probably become increasingly wealthier and more confident. “For the first time we will have a neighbour – Indonesia – which will have a bigger economy than our own. The economic and strategic changes in South East Asia would see real growth in regional defence expenditure, Richardson said. “This will not be directed against us, but it will mean the capability gap we have traditionally enjoyed in the wider region will significantly diminish and, in some instances, probably disappear. In 2015-16 the defence budget will reach 1.92% of GDP. The government’s commitment is for 2% of GDP within a decade. Richardson said the growing wealth of East Asia would not be shared across much of the other part of our neighbourhood – the South Pacific. Michelle Grattan is Professorial Fellow at University of Canberra. The link below is to an article reporting on the South China Sea stand off and will the USA get dragged into it once the shooting starts? South China Sea: Will it Come Down to War? Sansha City has jurisdiction over 750,000 miles of surrounding waters Philippines and Vietnam refuse to recognise new arrival U.S.